Today we’re going to talk more about money. Last column I discussed some of the quirks of coinage as a unit of weight backed by the commodity metal it’s minted from. This time, I’ll talk about other kinds of money. Representative money is a unit with no intrinsic value - such as a zinc disc, or a slip of durable paper - that can be exchanged for a precious commodity, such as gold or silver. Why switch to representative money, however, if the previous coins minted from commodities worked perfectly fine before? Remember my previous column, where I mentioned how precious metal coinage could be defaced by shaving and milling. Having the coinage itself be base metal, exchangeable for commodity, would help ensure and protect its worth. Moreover, if the coin itself is just a token exchangeable for gold or silver, why not use lighter media such as paper or cloth as units of exchange for units that would be unwieldy to carry around? Five thousand gold pieces weighs about a hundred pounds, if you go by D&D 5E’s estimations - kind of unwieldy for most purposes. A letter of credit from a certified bank, backed by its reserves of gold, however, makes for a more convenient token of exchange than the coinage itself. This lends itself well to settings with established, entrenched mercantile banking systems, especially if the PCs are going to be dealing in units of cargo. Representative paper money is vulnerable to forgery, however, which means, of course, that counter-forgery measures will enter use. For example, modern paper currency utilizes watermarks, specially made paper or polymer, and holographic strips of metal embedded in the note’s surface. A setting with widespread magic might have slightly more exotic ways of demonstrating its authenticity. 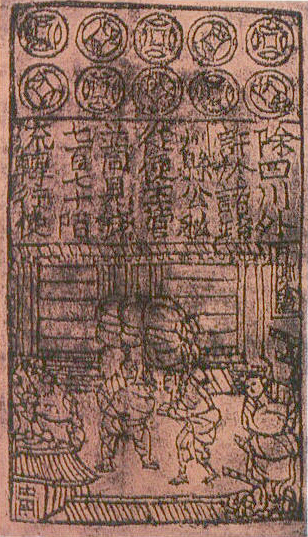 A rather more white-collar thieves’ guild might be locked in an arms race of exploits and countermeasures, with squads of roguish alchemists performing experiments to reverse-engineer an alchemical ink used only on authentic banknotes, while a bank’s own experts examine forgeries in order to refine their techniques. Magic could also be an interesting way of protecting paper money from forgery. A letter of credit signed to a specific bearer could be reinforced with a silent image displaying the features of its owner. Such a note would require disguises to successfully use if filched, and imagine trying to pick pockets if a banknote screams that it’s been stolen once it’s been taken? The note’s rightful owner would of course have received a token from the bank that silenced the magic as long as both were in their possession. This can lead to an entertaining world building wrinkle. Imagine if you will, a guild of commercial wizards who specialize more in banking, logistics and long-range communications setting up their own bank. Their arcane measures would make their banknotes the most reliable ones in a region, and their access to non-couriered forms of messaging means that they could establish branches in faraway ports without too much difficulty. Now consider dragons. They are sapient, long-lived, and love piles of treasure. An enterprising dragon could form its own banking system run by kobolds day-to-day, a monstrous counterpart to the wizard-backed bank. Both the examples above - the wizard’s guild or the dragon - would make for an excellent patron for a group of PCs, especially if they own their own trading vessel, or journey for rare commodities such as spices and gems. Those would also make for entertaining dungeon plans, given the necessity for vaults and guards, and provide an exciting backdrop for a heist adventure. This article was contributed by M.W. Simmes as part of ENWorld's User-Generated Content (UGC) program. We are always on the lookout for freelance columnists! If you have a pitch, please contact us! It is too bad that we don't know more about how the Knights Templar made their letters of credit system work and how they protected themselves against fraud (cite: https://www.bbc.com/news/business-38499883). Florence's bills of exchange would be another historically appropriate model to use. The article I cited above discusses how this created a private currency outside of the control of any sovereign. Discussing checks and balances in financial institutions may seem like a boring topic for your fantasy role play, but there are plenty of interesting hooks if you at how some sovereigns in history sought to gain control over the bankers. Most famously, King Philip IV of France's destruction of the Knights Templar. Some help on the templar thing. Citizen goes to the coffer house. At their height the templars may have had close to 10000 of them throughout the lands. Cited number is near 9000 so I'm being aggressive. Citizen drops off stuff and gets a letter of credit detailing what they dropped off and it's estimated value. Letter of credit is good at any other coffer house and has two things going for it. First is the date of the document tied to a proof code that consists of three or more numbers. The example in the collection I refer to has a three digit number. The combination of the proof code and the date advises the coffer house of the cipher to use to prove authenticity. Last thing is that there have been indications of a cipher alphabet on the stamped seals at the bottom of the letters. My estimation were I to have an opinion was that the above mentioned proof code in combination with the date and the cipher stamp will tell folks whether or not the letter can be trusted. Citizen goes to coffer house in another area, and they get equivalent value. Now in a magical world, this gets much simpler, or much more complicated depending on how detailed you want to go. Edit: Note that letters of credit attributed to the Templar are from what I know exceedingly rare and always of questionable authenticity. Take this for what it's worth and not from a position of fact. Paper documents may have worked well in the real world for the Templars and their customers, but in a D&D type world where fireballs, burning hands and dragon breath are common perils, trusting your net worth to a piece of paper would be a risky business. Some type of magically/alchemically/special Dwarf minted coin with a noted worth might be a better approach. The value could be stamped on the coin at the D&D equivalent of the Templar coffer house and the authenticity verified by lay folk via a 0 level spell that almost anyone can cast. Of course, the process to create the coin would be a closely held secret. Part of the creation process for the coin could include various protections against harm, for a small fee of course. I know that asking for logic on these boards has been a mixed bag, but fire was and is pretty common in the world last I checked. All of this is entirely reasonable provided your game world supports the premise sufficiently for your level of details. I can see it working for most. In my case, the dwarves would want to be paid for minting the coins, the lay folk that knew the cantrip would unionize and hide the secret of the spell behind a training program then negotiate themselves into a middle class that cost the bank money and the creation process would need to be guarded more heavily than the actual loot underpinning the financial system. All of these things raise costs and work against the reason why banks formed in the first place, to make money. As you've shown though there can be a bunch of different ways to approach this. I only replied because concern about magical fire as the primary reason to be concerned about paper is missing the point that mundane fire exists, was a threat to the templar system, and that functioned well enough. GM: Ok, having defeated the ancient Lich of The Thrice Fallen Citadel you soon discover the seal chest in which he held the ancient treasure for which he devised his infernally cunning labyrinth of death traps. As you open it, your wondrous eyes appears banknotes worth tens of millions of gold coins! GM *makes several rolls*: Okay, Dafydd the Bard makes his history check and realizes that the bank which backed these notes went out of business when the Citadel fell for the 3rd and final time. An appraise check reveals they may be worth a few hundred copper to a collector, if you can find one. Yeah, banknotes just don't have the same flair. Just put your letter of credit in a fireproof / waterproof box. Its not like a checking account. Its just a way of moving money from point A to Point B without dragging a bandit lure around with you. Not to speak of the weight and bulk. The letters are usually only good at the local branch of the issuing institution (or an allied one). Merchant companies will issue them in my game. They have a magical seal. And if all else fails and you counterfeit one, well, that's what Assassins Guilds are for. So don't use them the way you described and there won't be a problem. GM: Ok, having defeated the ancient Lich of the Thrice Fallen Citadel you soon discover the secret sealed passageway to the antechamber in which he held the ancient treasure... you're surrounded by what must be hundreds of thousands of coins and various items in a room that's better described as a great hall with ceilings that reach easily to the 20 or 30 ft mark. Players: Score! Alright guys, camp down and set a defensive perimeter while we send 2 retainers and Horus back to charter a caravan to get this stuff back to town. GM: (speaking as the conscience of one of the retainers) Keep in mind that this kind of horde could very well result in other adventurers coming in to take you out if rumors start filtering back to the wrong people. Horus: Yes, good idea red shirt number 1. Best course of action is to contact the "bank" (templars, merchants guild,) and commission their small army to come in and catalog this stuff for the standard X% cut. It may take a while but we can go through what we have here with the appropriate support and walk out with what we can carry and the rest in bearer notes. That is of course if the level of detail in your game would require/support this sort of thing and it would be fun to your players. That is why all coins are generic and universally accepted among all cultures, races, and kingdoms. And why you seem to find them even on creatures that would have no use for them. Aren't held papers and flammables immune to fire spell damage? I would imagine that the well to do would just hire people to hold all their important documents. I hope the next article will address inflation and deflation and how they apply to fantasy worlds where adventurers often bring in loads of precious metals back from dungeons and where gold or silver is often permanently destroyed to power magic rituals and item creation. We take you now to Iron City where the Evil Mad Monk Morrus Mortimer Millionaire has been spending his ill-gotten gains from Smog horde. Here's a thought: clip a gold coin, then cast Mending on it. Repeat often enough to amass a small pile of gold dust. Or: buy a cheap flawed gemstone. Cast Mending. Sell your newly flawless and much more valuable gemstone. I guess that is better then buying a ladder, stripping off the rungs and then selling it as two 10 foot poles. On the OP: Livestock was often a type of "money" - at least wealth. Also, the Koku - which was both a unit of rice and currency in Japan - should be considered. 1: Real world. You live in a small village. You win the lottery, an immense amount (say 100 million dollars). Is there an inflation boom in the village? No. a: the gems will be kept for emergency/easily portable treasure. The magical items kept or traded. Only the gold/silver will be injected in the local economy. b: A quarter of a million gp is not that much wealth. I've done math calculating the average GDP per inhabitant previously (you can see this link for the math: https://slugsandsilver.blogspot.com/...e-rewards.html , I also posted about it on this forum). The average income is about 220 gp/citizen. So a town of 2000 people will have a yearly income of 440 000 gp. The extra gold will be good for the local economy yes, but it will not lead to ridiculous inflation. so.... the notion that adventurers and their gold lead to massive inflation is misleading. However, it will be good for the local economy as there often was a shortage of currency. Slight inflation? Sure. A spike in the price of one or two items because the party suddenly bought all the supply (say, healing potions?)? Sure. Overall inflation that the GM should bother about? No. I think the number of adventurer's in the world would matter. If the campaign works on the "Chosen Ones" model, where only the PC's are raiding tombs, looting dungeons, and killing dragons, then yeah their impact would be minimal. On the other hand if the campaign uses the "World of Adventure" model, where there are thousands of adventurers all over the continent, all doing adventuring-type stuff, then they might have an impact on the overall economy. On the level of professional athletes and their related infrastructure does today - a local football or basketball team can have a significant impact on the local economy. A local "Adventurer's Guild" might do the same. This is a good point - but I think that the "liberated hoards of gold" phenomenon would remain rare - after all, there can only be so many hoards! If "adventuring" is common as a career, soon almost all hoards would be found/liberated. If you wanted to be "realistic" about it, yes. My current campaign uses a "World of Adventure" model, and there are few hordes to be found - usually in the possession of creatures capable of dealing with groups of adventures. Instead, treasure from non-sentient creatures usually consists of their hides, claws, and organs that have absorbed and concentrated the magic of the world, making them a valuable resource for alchemists and enchanters. But that is an additional layer of complexity, and "GP" is a convenient abstraction for most games. - In order to mend the gold coin you'd need to have the original that you clipped. Mending does not work on the clip. - In order to mend the gemstone it would have to be flawed due to damage. Mending an object that by default has a flaw, would result in restoring the flaw. You can't restore something that was never anything to begin with.